Awesome report, and I’m hoping they stay in line with the 0.5-1% area!! That’s more of what I expect if the pricepoint’s to remain at 7.99! I’m sorry, I disagree with that statement. Which is ok, we all have different opinions. However, MF extracts are $22 for 15ml, and $39 for 30ml. Flavorah are $5.49-17.49 for 15ml. I feel $7.99 for 30ml extract is very reasonable and competitive compared to the competition. Thank you very much @dwdh586 for all your time and work in testing and write up. Very useful info! Which is ok, we all have different opinions. However, MF extracts are $22 for 15ml, and $39 for 30ml. 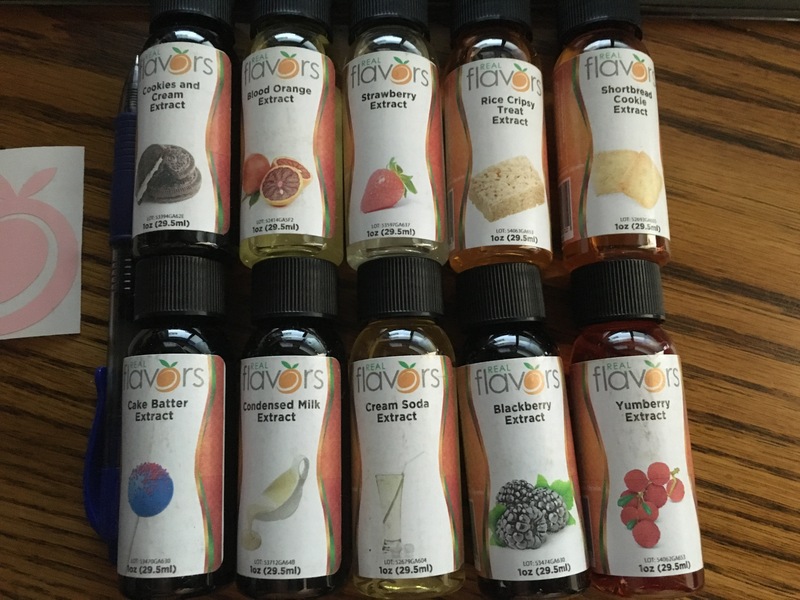 Flavorah are $5.49-17.49 for 15ml. I feel $7.99 for 30ml extract is very reasonable and competitive compared to the competition. That is my belief as well , I don’t get hung up on percentages but I do understand why others do and that is fine.Everyone needs to use what works best for them , there is no right or wrong.I am just glad we have as many choices as we do! Thank you for your time , I hope to have mine by the weekend. @Nicotine_River will these other locations be selling extracts? I know you have no real control of what another company sells, but was wondering if you know where they would be available at…? You’re absolutely correct, and I stand corrected. For whatever reason, I was thinking that it was 7.99 for 15ml (no idea why). I agree that it’s within reason for 30ml. Percentages are a personal thing (as you point out) to which I mostly agree. When it comes to those of us who “have to” stay above a certain percentage VG-wise (thanks to PG sensitivities) it quickly becomes evident why flavor strength (percentages) becomes so important. Especially as the number of flavors increase in a single recipe. As for MF, I’ll never spend $25 for a single bottle of flavoring. It’s hard enough for me to justify theirs when they’re on sale for $15+ because as I mentioned in chat earlier, the first thing I think is “I could have 5 15ml bottles of quality flavorings for ONE of MF’s”. Even though they’re typically used from 0.25-0.75%. Maybe if someone packaged them in 5-7ml for $5 or whatever…anyways. Nonetheless, I appreciate your addressing the error in my comment. Sorry for not having my facts (thoughts) straight before posting. Thanks for the reviews! Can I make a suggestion though? With this type concentration I would recommend starting lower, like maybe 0.5 or 1%. Two reasons. It’s kind of like when making any recipe, you can always add more if needed but reversing overdose is not as easy. Second is the subconscious effect from hitting it too strong. You don’t want to have your brain locked in on something overly powerful that may negatively influence the experience if later diluted. Just my opinion - take it for what it’s worth. But thanks again! Thank you Walt for making these flavors available. Once I’ve had an opportunity to test them all I will certainly be a loyal customer for the ones I like. Question - what method is more beneficial to you - for us to buy from RF direct or through a third party? Because if it is better to buy from you that’s what I will continue to do. Yeah, in my zeal… I missed the decimal point… what can I say… when it comes to focus, I could use… was that a squirrel? … er, wait. What was I saying again? All kidding aside, I’m going to half the percentage on the next three flavors and see how that goes. Well I’m finally on board the RF Train… These Raw Extracts sounds like they would be good for how I like to mix. These Raw Extracts sounds like they would be good for how I like to mix. I hope they work well for you , I am excited to have you as well as @SthrnMixer giving these extracts a try. Looking at your list I should have gotten all the ones you have too as that’s right in my groove! Have fun brudda. Question for ANYONE who has experience with theRaw Extracts…Will these need to be used with sweeteners, being that they are simply the Raw extracts of the flavors? I’ll be honest, the Marshmallow is VERY sweet as it is… you probably can use it as a sweetener. I think @Walt_RealFlavors had mentioned it’s likely you would want a sweetener with some of them… Correct me if I’m wrong, Walt. If it’s as good as he says, I trust his transparency and believe it does cost a lot to make it. So if I become addicted I may pay more. Absolutely. It’s highway robbery to me, and I don’t care how good they are. That’s the wonderful part of diy… Something for everyone. I thought it was robbery when I bought cheap flavors that had little to no taste of something similar to the flavor on the label. I probably have nearly 700 flavors in my home stash. Of those I use about 150… now that’s robbery. My search-fu didn’t turn up anything here. I’m trying to order some raw extracts and it doesn’t seem that the ELRECIPES code is valid. Am I missing something, is there a new code or is it just not valid on these products? No discount code for the extracts I was told.It still works on the regulars just not the extracts. Just did the “sniff” test. All these smell amazing, but that Strawberry. OMG! That is the absolute most realistic strawberry smell I’ve found to date. Of course the taste is what counts, but if that is anything like the smell. Well, what a treat!